A properly machined sheave groove allows a wire rope to pass through unhindered by friction or obstructions. 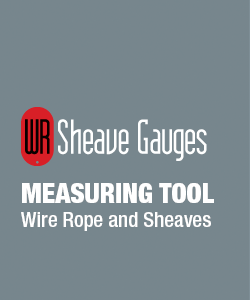 Sheaves should be checked periodically for wear in the grooves which may cause abrasion, pinching, and bird-caging of the rope. If the groove shows signs of rope imprints the sheave must be replaced or re-machined and re-hardened. The correct size sheave is required to minimize wear and tear on the rope or wire. When grooves become overly worn or are too large, they may allow excessive movement, which stresses the rope and reduces its longevity. Likewise, too small of a groove compresses the rope and reduces its useful life because the rope will roll into the sheave groove introducing torque and twist which may cause high stranding and bird-cages. Wire rope will wear the bottom of the sheave groove to a radius smaller than the radius of the sheave. To determine the amount of wear, place the proper size gauge in the sheave and shine a light behind the gauge. Light should not be detected between the gauge and the root of the groove. If wear is evident, the sheave should be re-machined or replaced (see Figure 2).